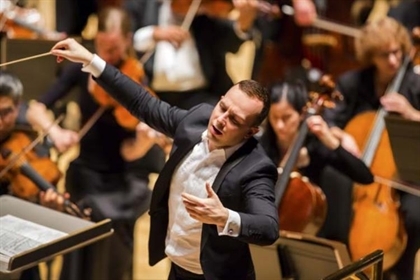 A notable opera conductor, Yannick Nézet-Séguin made his debut at the Salzburg Festival in 2008 with a new production of Roméo et Juliette, returning to the city for the 2010 Mozartwoche and for Don Giovanni at the 2010 and 2011 summer festivals. For The Metropolitan Opera, he has conducted Carmen, Don Carlo and Faust, with La Traviata opening next month and will continue to appear each season thereafter. His 2011 debut at Teatro alla Scala (Roméo et Juliette) was followed last year by his first production for Royal Opera House, Covent Garden (Rusalka) and returns in a later season. Music Director of The Philadelphia Orchestra since the start of the 2012/13 season and Music Director of Rotterdam Philharmonic Orchestra and Principal Guest Conductor of the London Philharmonic Orchestra since 2008, Yannick Nézet-Séguin has also been Artistic Director and Principal Conductor of the Orchestre Métropolitain (Montreal) since 2000.